Clarise turned 10 last Monday. Unlike the previous years, she didn't want a party...she said all she wants is to have a family celebration at Master Grill (her favorite resto) and that I make her an Ube Macapuno Cake...and that we buy her a laptop and a Kindle Touch. I'm not sure if she really didn't want a party or she was just trying to be considerate because she knew that the gifts she requested were kinda expensive. Anyway, we granted her requests...all of it. We ate at Master Grill with some friends last weekend...we bought her a laptop and a Kindle Touch...and I made her an Ube Macapuno Cake. I also prepared some of her favorite food that she said she wants to eat on her birthday. 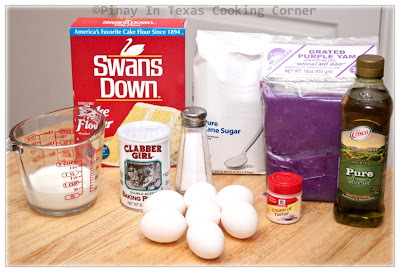 Thanks to Abigail of Cuddles and Crumbs for the Ube Macapuno Cake recipe. Clarise and everyone else loved it! 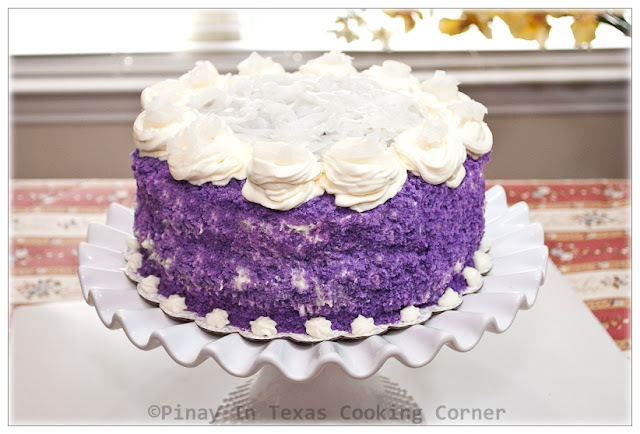 Ube Macapuno Cake is one of my family's favorite cake from Red Ribbon Bakeshop in the Philippines. It has been almost 5 years since the last time we had it. I'm really glad I was able to find a good recipe! 1. Preheat oven to 350F. Line two 9" round, 1½" high pans and one 4"x8" loaf pan with parchment paper. 2. In a large bowl, sift cake flour, baking powder, ¾ cup sugar and salt and mix until well combined. On a separate bowl, combine egg yolks, oil, milk, and ube. Add egg mixture to flour mixture. Beat on lowest setting until just combined. Set aside. 3. In a separate bowl, whisk egg whites on high speed until frothy. Gradually add in remaining ¾ cup sugar and cream of tartar and beat until stiff peaks are formed. Gently fold in egg whites into mixture until very well combined. 4. Divide batter into prepared pans. Bake for about 30 minutes or until a toothpick inserted into the center of the cake comes out clean. Allow to cool down in pans for about 5 minutes then transfer to wire racks and allow to completely cool down. In a small bowl, beat cream cheese until smooth and creamy. In another bowl, beat heavy cream, sugar and vanilla on high speed until stiff. Slowly fold in cream cheese and beat again at high speed for a few seconds just until well combined. Be sure not over beat your frosting. 1. Drain some of the syrup from the macapuno. Set aside. 2. Place one of the round cakes on your serving plate or cake board. Spread and level about 1/3 of frosting onto the cake layer until it is about ¼" thick. Top with 1/3 of the macapuno. Place second round cake on top of macapuno. Spread the next 1/3 of frosting to cover top and sides of cake. 3. Remove sides and bottom of the loaf cake. Cut the cake into cubes then crumble using a food processor or blender. Gently stick the crumbs to the cake top and sides until it is fully covered. 5. Using the remaining frosting, pipe out big rosettes around the cake’s top edge, and some small ones around the bottom part. Spread the remaining macapuno in the center of the cake. You may also top the rosettes with macapuno. I only made 2 layers. If you want more filling, you can make it 4 layers by dividing each round cake into two but you will have to double your frosting ingredients if you will do that. Happy Birthday, Clarise!! WOW! That cake looks like Red Ribbon's. I bet you it tastes even better!! Love this!! Thanks Jun! The cake was so good. It was all gone before I knew it. I really want to make this cake. The color is so vivid and stunning, yet it is all natural. Also, I see some other ingredients-olive oil and the macapuno, which also lend some great flavor and texture qualities. I am saving this recipe and will look for the ingredients at the specialty market. Easy to see why it is a favorite. Also, I think your daughter was trying to be considerate by stating she did not want a party. Happy tenth birthday to your sweet daughter! Happy Birthday to your daughter and may God bless her always. The cake looks amazing and I'm sure the taste was even better, I have to make it some day! very nice website and recipes i like that cake and macapuno is new to me. i use alot of coconut milk in cooking thai cuisine and thai bbq and coconut cream for desserts. Happy Birthday to your daughter! She is adorable! The cake looks so festive and delicious. Have a wonderful week! Happy Birthday young lady! This looks like FUN work. I bet you had a ball making this. Happy Birthday to Clarise. She had a quite a birthday spread, and the cake is stunning. Your food always looks soooo good!! Love this "purple" cake! 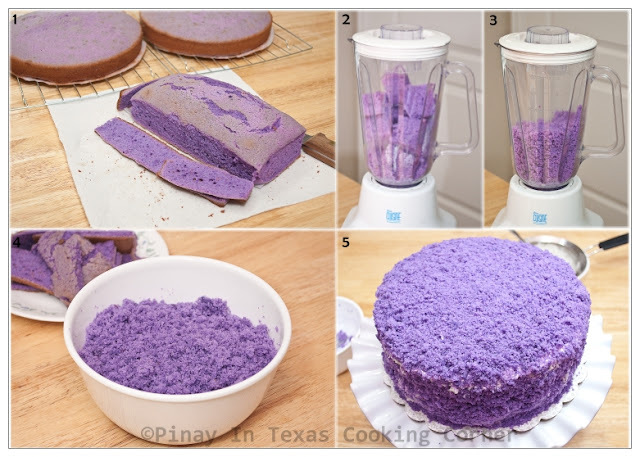 At first glance, I thought it was colouring that make the cake "purple"...then I realise that it was yam! I bet this cake must have great flavours and texture! Yum! Hi Tina, your cake look so lovely and delicious. I like the purple color, so sweet looking. I'm so happy everyone enjoyed the cake. Thanks for the recipe, Abi! One of my fave cake ! It looks fantastic , Tina ! Happy Birthday , Clarise ! Happy Belated birthday to your daughter and wow!laptop for birthday gift? She is so lucky to have a mum like you. I noticed that the yam/taro seems to be a fav for your family. Quite a bit of recipes you have shared using that ingredient. Anyway, I too simply yam/taro, just that for us the fresh ones are easily available and quite reasonably priced. The cake looks so superb with the standout of colors and I must sure the taste would have been the same too. Happy birthday to clarise,,,and she deserve that looking gorgeous and Yummy cake,i love the color !! It looks like you all had a great time- happy birthday to your big girl! The cake is interesting- looks very yummy. I never saw the purple yam before. I will have to look for this and try this cake. You certainly did a lovely job- looks like Easter and spring! Love seeing your bake, Tina! Clarise is lucky to have such a talented mom :) Happy bday, Clarise! My daughter's favorite color is purple. She would love this cake. What a fun cake! You are such a good mom! :) Clarise looks very proud of here cake. Hope she had a wonderful birthday! Happy Birthday Clarise! I want to be like a mom like you! You always make homemade birth cakes for every birthday (right?). 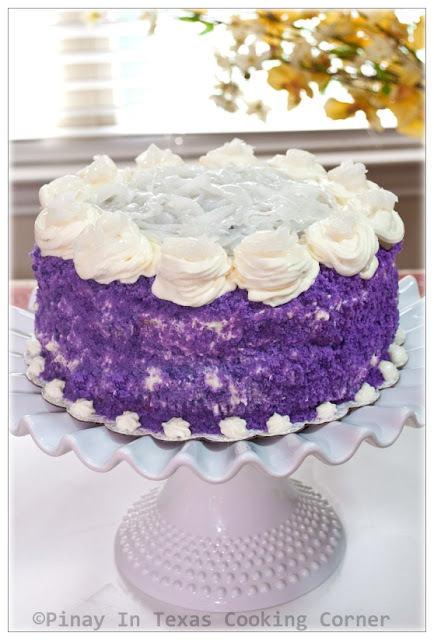 These Ube Macapuno Cake looks absolutely gorgeous! Clarise is a lucky girl! :-) Great job Tina! Not really, Nami...only when they requested for it. Most of the time, it's my good friend (Christy) who makes the cake. Happy birthday to your daughter! 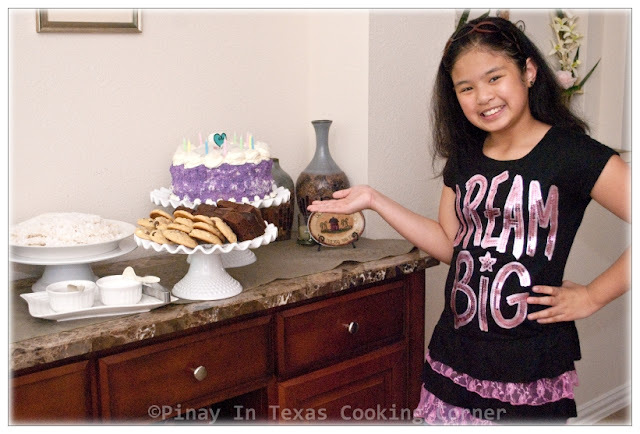 New to your blog, but I'm a Pinay in Texas, too! That cake is amazing! I made some for before Easter but it does not look as good as yours, I colored my frosting purple. Thanks for the recipe! Great looking cake! I absolutely love the violet! 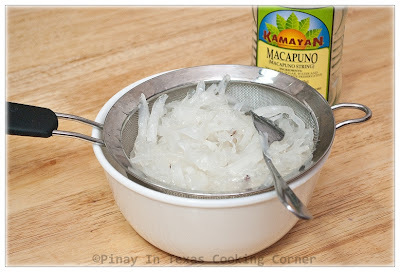 What is macapuno? Happy birthday to Clarise! I loove ube macapuno cake. My cousin bakes that for us sometimes. 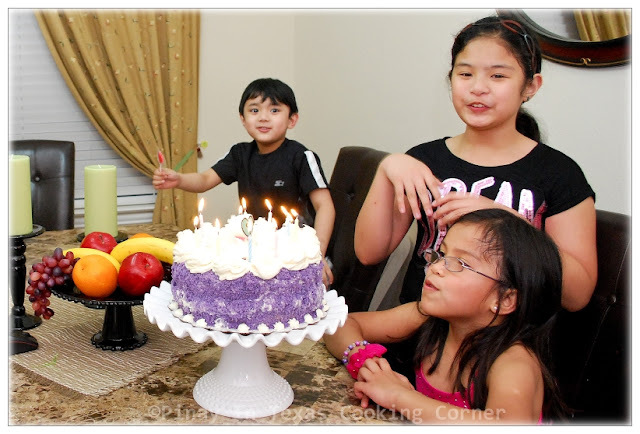 Happy birthday to your daughter, she is pretty, the Ube Macapuno cake looks really delicious, I love how you prepare it. I love ube cake! This looks so rich and tasty, I can just imagine the flavor. I'm glad your daughter had a great bday! PS - Made your ice candy, family loved it (although my American husband thought the corn/cheese was too weird lol). HI! That cake looks great! I would love to try this recipe..Just one question..Te frozen ube you used, did you have to cook it or you mixed it as is? You don't have to cook the frozen ube. Use it as is. Hi the cake looks so yummy ang mouth watering and i will try bake your recepi one of this days just one question it is very difficlut to find whipping cream here just want to ask if i can use all purpose cream for this cake?? Is it the same??? Hi! I tried using all-purpose cream before when I was experimenting. At first, I didn't attain the frosting consistency I needed. Maybe because the all-purpose cream I used was at normal temperature. I tried it again using chilled cream, I attained the desired consistency but it took a lot longer. I tried it for the third time. This time, I whipped the chilled all-purpose cream in a bowl over another bowl with ice and water. In doing that, I was able to attain the frosting consistency I needed quicker just like when I'm using heavy whipping cream. So my answer is yes...you can use all purpose cream as a substitute, but it won't be as convenient as using heavy whipping cream. Hi! You can use butter and milk but it will taste more like buttercream frosting, so I think double cream will be better. But like the all-purpose cream, I guess it will take a little longer to attain the consistency you need. I only use one cup of the frozen grated ube. What a great recipe this looks like! Just a quick question, I was wanting to make this for my mom for her birthday, but instead of a cake, could it be made into cupcakes? If so, what would you suggest be changed in the cooking instructions? THanks in advance for your time! Yes it can be made into cupcakes. Just put it into lined cupcake molds instead of baking pans, and bake it for a shorter period of time which is about 15-20 minutes. Allow the cupcakes to cool down. Crumb about 2 pcs. of baked cupcakes. Decorate the cupcakes with the frosting then top with macapuno and sprinkle with cupcake crumbs. If you want, you may inject a little frosting into the middle of the cupcake before piping frosting on the top. I haven't tried making it using square or rectangular pans, but if you will just base it on volume, for a 35x35x7.5cm pan, you will need triple the amount of the ingredients I used. You can decorate the cake the way you want it. If you want to be able to write on top, I suggest you frost the whole cake with the whipped cream cheese frosting, then just stick cake crumbs to the sides and just leave the top plain white. Instead of decorating the whole top part of the cake with macapuno just put it on the border. It really depends on how thick you want to frost the cake and how you will decorate it. I used the whipped cream cheese for both filling and frosting as well as the flower border and I still had about 3/4 cup excess. I guess using triple the ingredients would be more than enough for your square cake since you won't do layering. hi i followed the instruction how it was instructed but it didntturned out as color purple as ive seen from this photo. What kind of ube did you use? If you have noticed in my ingredients photo, the frozen ube that I used was dark purple in color. I've use a different brand before and I ended up having a light purple colored cake. If while mixing the ingredients, you noticed that it's not as purple as you want it to be, you may add a few drops of purple food color. Can i use ube powder instead of grated ube? Hope you can reply in my question.. I think you can...but I'm sorry I haven't tried it so I can't give you measurements for that. What subtitutes can i use instead of cream tartar? For this, you can use 1/2 tsp of white vinegar or lemon juice as substitute, or you can just omit the cream of tartar. Hi i want to try this cake but i want to ask first if i can use Extra virgin olive oil or corn oil for the olive oil? Thanks! Yes you can...but the substitution is not 1:1. The general rule of substitution is 1 cup of all purpose flour minus 2 tablespoons is equivalent to 1 cup of cake flour. So measure 1 cup of all purpose flour then remove 2 Tbsp of it. Some suggest replacing the 2 Tbsp of all purpose flour with 2 Tbsp cornstarch, but if you do that you should see to it that you sift them together about 3x until the cornstarch and all purpose flour are well combined. Glad to know that have tried some of the recipes here! Can you use a regular yam with food coloring instead of a ube. My husband is from Bulacan and loves this cake, however we live in Wyoming and we have no where close that sells ube. Yes, you can Jessica! That's what my mother used to do when she was selling halo-halo back when I was in grade school. Ube was more expensive so she would just use kamote & purple food color in making haleya. Hi po! 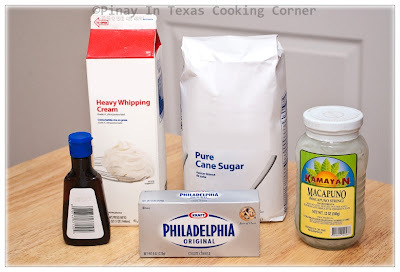 It's possible to leave out cream tartar from your recipe? Where i live there is no cream tartar anywhere.. Thank you po. Yes, you can just omit cream of tartar if it's not available. Hi po. As i was reading the comments, i found out that regular yam can be used and i'm so happy to know about that. There's nowhere i can get ube here in lake havasu! :( i'm just curious about the use of olive oil, what effect does it have to the cake instead of using vegetable or canola oil? Using olive oil gives cakes and cookies a light texture...and I find it healthier to use compared to vegetable and canola oil. Hi! I made the cake last week and it was a success!!! Im so happy and i will bake two more cakes next wk!! Refer to step #3 for the cake. You whisk the egg whites on high speed until frothy, then you gradually add in ¾ cup sugar and cream of tartar and beat until stiff peaks are formed. You don't add milk to it. 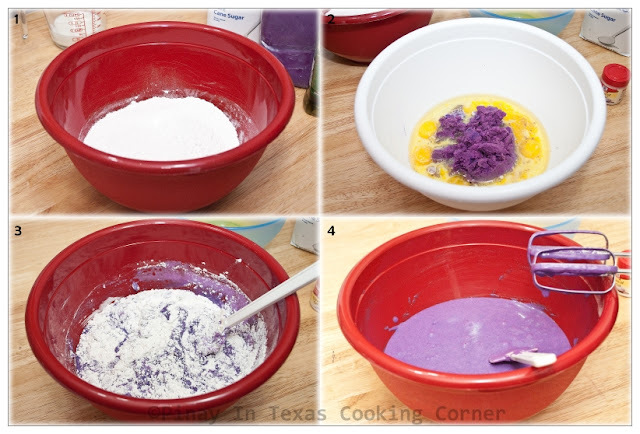 You combine milk with the egg yolks, oil and ube in step #2. I only have non-stick round pans so that's what I use...but you can use any kind of pan for this. Just be sure to grease non-stick pans with oil before lining it with parchment paper. hi,your recipe looks so tempting,can i use a bottled ube jam for this recipe?because here in my place there is no grated ube,only those one's in the bottle...hope you can help me with this. I haven't tried using bottled ube jam but I'm pretty sure that would work. Awww, I'm sorry it didn't turn out well for you. I honestly can't give you the exact answer on why your cake didn't rise. 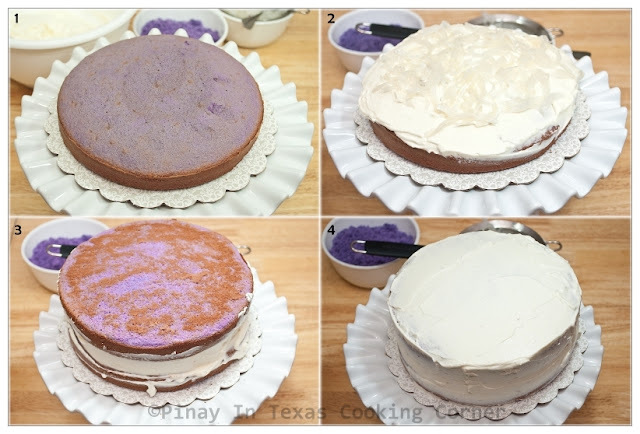 It's just either you over beat the meringue (beaten egg whites) or you over mixed the meringue with the ube mixture. You see, over beating the cake batter can cause the cake to collapse. You can also check your baking powder. If it's too old, it won’t work properly. And one more thing, opening the oven door during baking can also make the cake sink. You might want to remember these things next time. Great recipe. I was wondering, if I wanted to halve the recipe, would I use 4 or 3 eggs? Thanks for your time!